What Can Your System Produce? Even though the weather is constantly changing, your system should produce its designed capacity on some days. Find out from the ANALYZER-Best 10 Days screen. 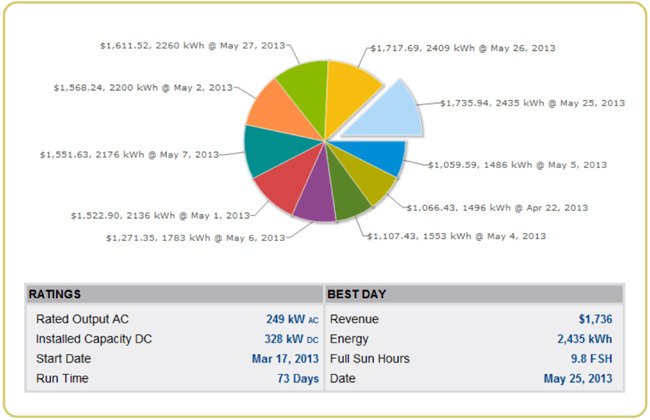 SolarVu® stores energy generated every day since startup. If peak output is significantly below what it was when the system was first commissioned it may indicate a degradation problem that needs attention. If several systems are operated in the same region, a comparison of best days, adjusted for relative installed capacity, can also be useful for determining good design practice.